It’s no secret that the world of episodic television is going through a period of tremendous creativity. 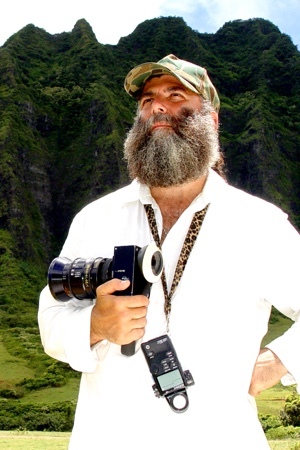 Continuing the ongoing series of interviews with creative artists working to bring a fantastic variety of story telling to the screens in our lives, it is my delight to welcome Crescenzo Notarile, ASC. 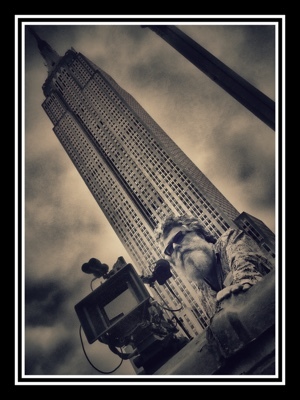 His career spans close to three decades, and in the last few years he has worked as a cinematographer on “Ghost Whisperer”, “CSI” and, most recently, the second season of “Gotham” – for which he is nominated in the category of outstanding cinematography for a single-camera series. In this wide-ranging interview Crescenzo talks about the changing field of cinematography, the rising bar of story telling on screens big and small, the crazy pace of working on half the episodes in a 22-episode season, collaborating with different directors over the course of that season while maintaining a consistent visual language throughout the arc of the show, what happens when the show heads into the post-production and his collaboration with his colorist and the VFX department, and how easy (or hard) it is to find a simple answer when people outside of the film industry ask him what it is exactly that a cinematographer does for a living. Kirill: Please tell us about yourself and what drew you into the industry. Crescenzo: My father was in the field of advertising, working as an art director, graphic designer, and illustrator… He was in very high demand at the time – a quintessential ‘Madison Avenue Mad Man’. One of his photographers at that time was Richard Avedon, and when I was a young boy, 4-9 years of age, I had the privilege and the opportunity to watch Richard work with my father, even though I was not aware of his fame at the time of course. Both my parents were artists, (my mom was an interior designer, sculptress, and painter), and we had hundreds of art books all around the house. I too wanted to become an artist, a photographer, and it all started when I was watching my father work. I was conscious of this at that time, and knew I had wanted to be a photographer ever since I was 5 years old… Soon thereafter, my father brought home my first 2 cameras; a Brownie, and a Polaroid – all for me! They are now trophied in a glass case in my office. Kirill: How much has your field changed since you joined it professionally? 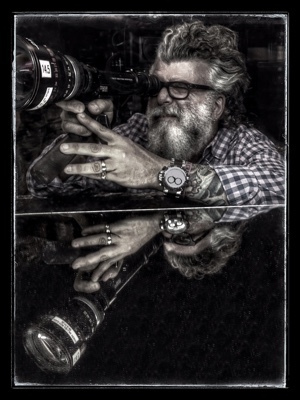 Crescenzo: They say that it takes a lifetime to become a cinematographer – and it certainly does! Every day is a learning process, perpetually shifting. It might be a new view point of aesthetics, new stimulation, new technology, new equipment, or a new philosophy in the way I think about my work and how I should approach it at my current state of mind. It might be the barometer of our pace of our society, our culture, and how we story tell our lives at this time of life. It changes day to day to day. You never stop learning in the art of what we do – because art is life! Kirill: Is it due to growing expectations from the production values, or perhaps the technology is getting more complicated? Crescenzo: I think, mainly because of the so-called, “bar”… The intellectual bar, the creative bar, the bar of the audience wanting more – that’s what makes it more challenging and difficult with each passing year. The bar itself keeps rising and rising. There’s so much brilliant content out there right now. There are so many wonderful shows, and it becomes more challenging not only to surface yourself above the few that are around you to be nominated, but also to just watch the content itself. You can only watch so much. There’s only so much time in the day, and one’s personal time in their day. That becomes challenging as to what shows you want to electively choose to watch, and why do you want to watch those shows. It is challenging for the networks, the studios and the executives. The bar keeps rising, not just at the creative level, but also at the physical content level. Kirill: Do you think that some studios prefer to focus on shows that are targeting audiences that are not as broad as what we used to have 10-15 years ago? Crescenzo: Yes! I think so. They have a very difficult job. And my guess is that this is one of the reasons for why the amount of episodes is now starting to change. In the classic network TV genre you have 22 episodes a season. That’s a lot of work and a lot of content, and a lot of investment of time! Now with channels like Showtime, HBO, Hulu, Amazon and Netflix, you’re starting to see that format change. It’s becoming 8, 10 or 13 episodes at best. And to answer your question, this gives the networks an opportunity to target more with more content with shorter schedules. But the paradox is that it becomes more challenging for the audience to pick and choose what shows they want to watch. And as the result of that, the studios have a much more challenging time to grab and hook that audience. I’m quite proud for our show “Gotham”. We’ve been critically acclaimed, and Gotham has been recognized with many accolades now. We’re proud that such a small show is amongst those gigantic productions as well. Because of that, we consider ourselves a gigantic show in many levels as well now. Kirill: You did half the episodes for the second season of “Gotham”. Would it be simply infeasible for you to shoot the entire 22-episode arc by yourself? Crescenzo: Yes, it would be almost impossible because of the amount of work that is involved. Out of 22 episodes I alternate with my rotating DP [director of photography] partner, Chris Norr, to split the episodes. as one shoots the current episode, the other DP is prepping for the following episode, and vice versa – back and forth for nine months. We prep for 7 days, and we shoot for 9 days. Right now I’m in the middle of shooting for episode 5 on season 3. As I’ve been shooting, my partner Chris has been prepping episode 6. The prep work is just as arduous and hard as shooting. You have to find your locations, to design the shooting and new sets, shot lists, schedules, tracking the sun for exterior shooting, and to work with your new and current director very close at hand as to the visual and emotional language of your current episode and story line… You’re designing sets, lighting sets, building sets, creating new things for that particular episode, looking at new locations, looking at new equipment because of those locations and parameters… New challenges and new ideas propel new directions. Our two leaders, Bruno Heller and Danny Cannon – ‘The Wizards’ and creative geniuses – keep our creative keel steady and in full force gliding in a world they have created for the audience. They are the engine of our machine. Our producer, Scott White, keeps the ship afloat with a keen eye and keeps our machine oiled and to make sure we stay strong as a Gotham family. Getting back to expand on your initial question, when you have scenes during the day time, many think it’s very easy. But the sun is your biggest lighting instrument and often your biggest challenge. Do you want to use it as the back light, front light or side light? Most of the day, the sun is above you – therefore it’s ‘top light’, therefore, your actors faces now have many harsh and ugly shadows on their faces, shadow raccoons under their eyes, etc, and your job is to make them look as beautiful as possible for the audience and protect them. This becomes a very arduous task of chasing light! You have to plan your shot list around that. You now can see how the prep becomes very important, thus, in a show of this magnitude, you need two DP’s to helm these very critical responsibilities. “Gotham” has a very large footprint of crew and equipment trucks. You’re out on the streets, and you look over your shoulder and there are 19 tractor trailers full of equipment. You have bathrooms, and catering, and holding areas for crew, etc… And you don’t just wind up going to a location and plopping yourself down. You have to get permits and find the available space for this footprint. Sometimes, when you finally choose a location of choice, it becomes unavailable for a plethora of reasons and now you have to change your location and find a new one, and now you have to mesh it into the schedules of actors and guest actors availabilities, etc… All this mental gymnastics happens during prep. It’s a very arduous schedule, and it’s impossible for one DP to do every single episode of a show of this caliber and size because of all the many critical moving parts of the cinema machine moving so fast and to maintain schedule… We shoot in New York City, and traveling through the city and its 5 boroughs, is an extremely difficult task. The traffic, the small streets, the one way streets, the ‘hot zones’, the perpetual constructions and paving of roads, all now being extremely exact in how we move as a company as efficient as we can. So, you can see the DP can not physically shoot every single episode because there’s just too much work involved in the prep stage, and there is no room for errors before an army of crew shows up to a set. Kirill: You’re working with different directors throughout the season arc. How does it work for you to find the rhythm of working with a new person every two weeks? Crescenzo: That’s the most challenging and, probably, the most stimulating part about my job. When you’re doing a show, a DP is the axle on that wheel. We are there on the set every single minute of every day of the season. We are the keel of that ship on set, and the directors that rotate in as invited guests, are the storytelling oars of that ship and particular episode. Throughout the 22 episodes of a season, sometimes you can have 22 different directors. On this particular show we have a handful of directors, a lot of which do multiple episodes. 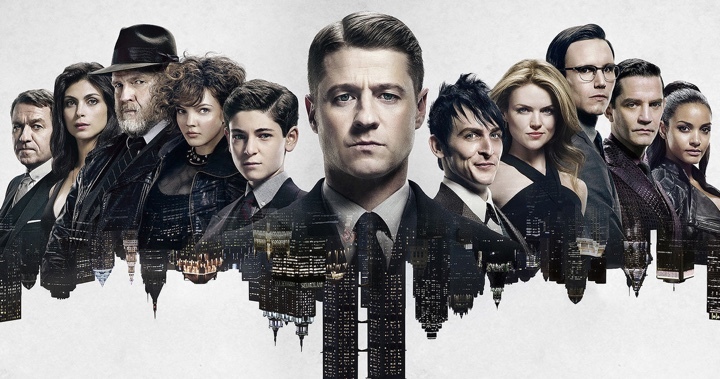 Gotham now has its family of directors who do multiple episode now. That is terrific because of the familiarity. But after they do an episode for us, they walk away and go on to another show. But the director of photography is on the show every single day to represent the show and all its philosophical machinations. As a DP, when you have different directors coming in, it’s challenging. That’s again the prep process. You want to be involved directly with the director during that preparation process. You’re having conversations, you’re talking to each other, feeling each other out, getting used to the sensibilities of each other, sharing your hearts, creative minds, and souls. It’s a marriage. It’s becomes that quintessential marriage on the set between the director and the DP. Every person is different. Everyone has something different to offer. Everyone has a different view point and a different sensibility. There’s no right or wrong in what we do. It’s a creative process and a very subjective medium. It does become challenging sometimes regarding rhythm. You finish one episode with one director, and you got used to that sensibility, and within the next day you shut that off, delete your creative folder and open your mind as a clean slate and start all over again with a new director and a new personality. It’s challenging, but not in a negative way. This is what we do. We assimilate ourselves, and it becomes a stimulating process. Sometimes it’s smooth, and sometimes it’s forcing a round peg in to a square hole – but as a professional, you can never have that be aware. Kirill: If you’re talking about the second season of “Gotham” and two cinematographers, I’d imagine that you still want to create a visually consistent language across the entire season, while at the same time providing an opportunity for those different directors to be creative in telling the stories of their particular episodes. How do you maintain that balance? Crescenzo: The backbone of the aesthetics of the show comes from the show runner and our executive producers. We have two creative bosses, as I have mentioned before. Bruno Heller and Danny Cannon. They planted the seeds of the look and texture of the show, of its tone, vibe, colors and aesthetics. We as crew, water these seeds daily, and cultivate its creative growth. The job that I and my rotating partner, Chris Norr, have as the directors of photography, is to follow those directions as close as we can. Our crew knows the show very well, and they are very much in charge of the constant look of it as well. Every DP has a different thumbprint, but we work together. We discuss everything and share with each other. We’re involved in each other’s episodes as well – talking about new designed sets, new challenges, new discoveries, new equipment that we have tried, etc… We essentially are the limbs of one body. It becomes challenging to keep that constant look throughout – but that’s our job as rotating DP’s. If we are very different, the audience will get very distracted and the seamlessness of story telling from week to week then becomes disjointed – like you are now watching two different shows. But as you said, you sprinkle your personality here and there from one episode to the next between each DP when you can. It’s challenging to keep the rhythm because you want that flow. It’s a testament when one can not recognize what DP did what episode when they look at the show. An astute eye will always know who’s shooting what, because of those little ingredients and the sauce that they’re sprinkling throughout however. But those two main executives – Bruno Heller and Danny Cannon – are making sure that we’re keeping that consistency and common thread throughout. Kirill: As you joined “Gotham” going into its second season, how much did you want to evolve the visual language of the show? Crescenzo: It’s all dictated from the script. The script is your seed. The script is what inspires you, what propels you to execute what’s on that page. The show that I did prior to “Gotham” was “CSI”, and my aesthetics on that show were polar opposite to this particular one. Your aesthtics must evolve and assimilate from one project to the next – this is important for a cinematographer. You must have diversified chops to execute all genres and many looks – otherwise, your career will be short lived. I grabbed a lot of comic books and I did a lot of research there. I quickly saw the visual language of the compositions of those illustrated frames. It was very exciting for me, and I used that as an influence to my work. My camera operators, Gerard Sava and Al Pierce, certainly help me bring that design to the compositions. They are wonderful artists, and certainly bring so much to our Gotham table. It’s all collectively part of the whole vision of looking and thinking and communicating. My two focus pullers, Braden Belmonte and George Tur, do an unbelievable job of keeping everything in focus with such a visual pace we have. Kirill: Is everything on the show captured in camera, or do you have additional visual effects [VFX] extension work that is done in post-production? Crescenzo: We try to capture as much as we can in camera. 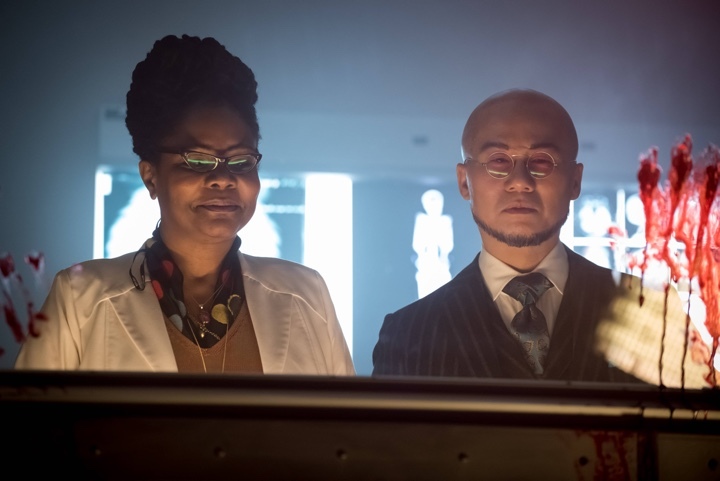 Gotham is very disciplined old-school way of film-making, meticulously designing each shot aesthetically with prime lenses – like photographs and frames of graphic novels, and not running and gunning on zoom lens, just hosing the scene down. We try to create everything in-camera and in each frame of shot to be as organic as we possibly can. Of course, this day and age, there’s a lot of VFX that we see before our eyes. It is very expensive, and we try to avoid VFX as much as we can. It’s not only because of our dignity of being purists as film-makers, but also because we want to be very responsible in terms of the cost. However, we have a fantastic VFX crew, led by Tom Mahoney, that’s part of the show. I’m really proud of what they do, not only to the show itself, but also to my work. One of the show’s signatures is its VFX. When we’re outside and you’re shooting a wide shot, they will visual-effect the sky most of the time, to give it that Gotham feel. It can be thunderous clouds, or time-lapse clouds or just brooding clouds sitting there. They do aerial shots and interstitial shots, with extraordinary integrity. It doesn’t look cheesy, and it flows very well with the show itself. They’ve received many accolades for their work. And when you take a show like “Gotham”, again, how can you not avoid VFX to enhance the visual imagery? We use that as a tool, as an advantage to enhance our storytelling process. We enhance the world that Gotham is in, to make it darker, more ominous and more evocative. Kirill: With such a strong and distinctive visual look of “Gotham”, how much of that is captured in camera, and how much is tweaked in post-production? Crescenzo: We do have a very strong visual language. Both me and my partner are proud of that language because it has essentially become a principle character itself. I repeat the word ‘principle’. It’s very iconic, and it has a particular signature which is very hard to do. And we’re proud that most of that is captured by us on the set. We choose our colors as we light, we choose our lenses and our look as we shoot. Of course, I work with a colorist who I’ve been working with for a very long time. His name is Paul Westerbeck, and we have a very strong relationship. I think he is a genius. My partner and I also programmed certain LUTs [lookup tables] in the system with my digital imaging technician, Dan Brosnan. I’m enhancing the look by way of changing color temperature directly in the camera. I’m using filtration to enhance the look that you’re referring to. We use tremendous amount of theatrical gels on set, and you can see and feel that emotional visual dramaturgy of ‘graphic novel’ story telling. We have a very talented team of people collectively as a whole. We’re all creating that look. We’re proud of that look as this is what we as artists are collectively doing on the set. This is our creative pride as crew members, and as individuals. Kirill: You talked about scouting locations for each new episode. What about the main recurring sets? Are those mostly on stage as they keep on appearing in multiple episodes? Crescenzo: Out of a 9-day production for an episode, on average we are out between 4 and 6 days. The more you’re out on locations, the more expensive it gets. It’s a tremendous amount of money going out on location. You’re paying the location fees, the permits, the parking, the catering, the extras, the city, the police, etc. 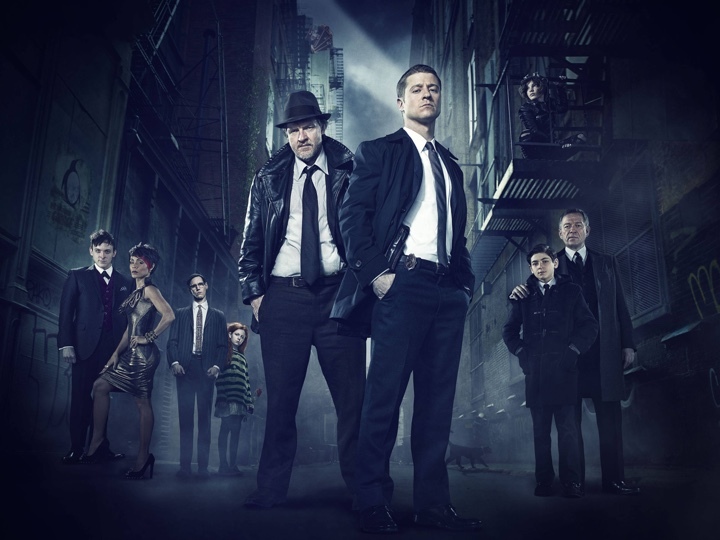 Our show goes on location much more than an average show because “Gotham” is streets. It’s night-time photography: underneath bridges, by the rivers, in dark alleys, all to absorb the emotional textured feel of Gotham. We’re forced to take advantage of the tremendous locations that we have here in the five boroughs – this show really cannot be shot anywhere else. You have to have standing sets built on your sound stages in order to keep that consistency throughout the season and cost in your parameters, otherwise, you can potentially have a run away financial train on your hands. If you’re just shooting every day out on location, the show will never succeed financially. We have two sound stages at Steiner Studios at the Brooklyn Navy Yards in Brooklyn. We have about 4-6 sets in each soundstage, jamming them in. When we’re not shooting on location, we’re at home on those stages. The schedule picks up a bit when you’re there. Kirill: You’re nominated for an Emmy this year for your work on one of the episodes (episode 19 in season 2). How does the selection process work? How does that particular episode gets selected out of all the episodes you did? Crescenzo: It’s a difficult process. i go through it every year with extreme frustration, and it’s so arduous and almost impossible to pick just one episode that you want to represent your work, signature, and reflection of you as a cinematographer. And then, within that episode, you’re only allowed a few minutes, it becomes that much more painful. You’re doing 45-60 scenes an episode, and so many episodes per season, and you have a lot of work that you have underneath your belt. And with this show it’s all brilliant work, collectively as a whole. It’s very frustrating to choose a particular episode and a particular scene to represents you for an Emmy nomination. To answer the specific question, I chose a particular scene from this episode – #219 – because it was very audacious. We have Azrael who comes back to life from the hands of Dr. Strange after Jim Gordon played by our lead actor, Ben McKenzie, and kills him as Mayor Galavan. 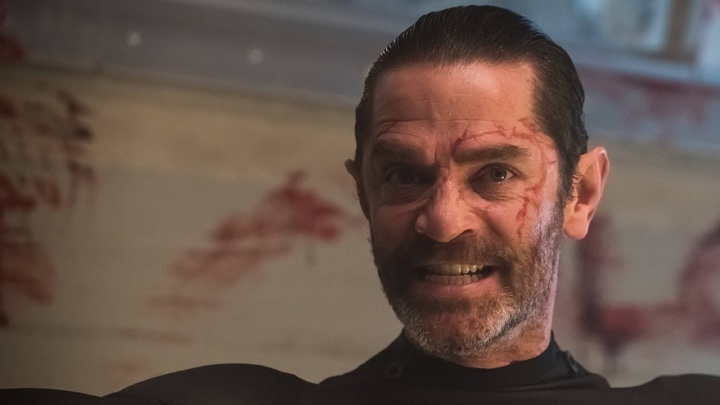 We find ourselves inside one of our main iconic sets – Gotham City Police Department – and there’s a stunning fight sequence, choreographed by our stunt coordinator – who also is nominated for an Emmy, Norm Douglass, between Azrael with a sword and our principle characters inside of GCPD. And within that, there’s a blackout! Therefore, all of the lights are now out in my main set. All the tools are taken away from me, and it became very challenging. How do I execute shooting a highly crafted fight sequence in a place that is supposed to be totally black? How do I expose that information with such precise lighting choreography, where the audience can see the information and follow the story, yet, let it still feel like it’s completely in darkness to evoke that haunting mood – otherwise, it will be distilled emotionally. That became very challenging to me as a cinematographer. My only source was the use of moonlight through the windows. I had to surgically sculpt paths, beams, pools and edges of light. I had to focus those patterns within the fight sequence, and it was challenging. I chose this particular episode for the Emmy nomination because of all of this. I figured that if anyone is going to appreciate how hard it is for a cinematographer to light within the constraints of a blackout scene, it would be my fellow colleagues, my peer group as cinematographers. It’s a very emotional and wonderful feeling to know that you’re nominated from your peers. That’s probably the most critical audience that you’re going to have, and that’s most meaningful. Kirill: You’ve talked about the finer technical details of what you do. When you meet somebody for the first time and they ask what you do, how do you describe it? Do people understand the scope of your work? Crescenzo: Absolutely not, and to be honest, I can never explain to anyone who is not a film-maker what I do as a cinematographer. What I do is so overwhelming and challenging, and truly has so many nuances that make up the whole that cannot be described because a lot of it is not just technical, but instinct and relying on personal approaches. The machinations of what we do as cinematographers are enormous. There are so many elements, and it’s very difficult to explain that to someone who’s not in the industry. When people hear that you’re a director of photography, most think that you have a camera on your back running around. They really don’t know what that is. And when you try to explain, you realize that it’s difficult to explain what you do. It is so detailed, and the best way I can say to a layman is that a director of photography is the one who’s trying to tell the story visually. I always say that if you shut the sound off and you cut all the words out, and mute the music and all the sound, you still should be able to follow a story visually. That’s what a director of photography does. They manipulate the mind and hearts eye subconsciously, and you should be able to follow a story somehow by the pictures you’re creating. You’re moving the camera, you’re placing the camera, you’re choosing colors, you are lighting to guide the eye, you are subtracting light to evoke emotion, you’re choosing the lenses to subconsciously push certain brain concentrations so that people can follow and feel the story without words. That’s the job of a director of photography. To cry or laugh from a photograph is truly rewarding. Kirill: Do people get what you’re trying to say? It still sounds a bit abstract. Crescenzo: You’re correct. They never 100% get it. They look at you with a dumbfounded face, scratching their heads. That’s just the way it is. I don’t know how to further explain that. Kirill: Do you think it’s part of the magic of storytelling? You have hundreds of people that come together to work on one piece, and there are so many hands participating in telling that story. Crescenzo: You’re right. It is the magic of moviemaking. There’s an expression that there’s a lot of smoke and mirrors involved to create something that’s bigger than life. It is a very magical medium, and it’s hard to explain that. Kirill: Looking back to your two previous productions, “CSI” and “Ghost Whisperer”, what stays with you as the time moves on? Crescenzo: It’s a combination of many things. You’re with a particular family for a certain amount of time. Within that time you go through highs and lows. The pressure and the schedule are always there. It never changes, and in fact it keeps getting harder and harder. Like I said earlier, the quality bar keeps getting higher, but the time and the budgets remain the same. It becomes more challenging. Time is your biggest enemy when you’re in production. Time is always against you. When you go from one show to the next, you remember mostly the good. I personally remember my family of crew members. When you’re working with crew, they become truly your family in a very direct way. You can’t avoid that when you’re working that many hours per day, per week, per season with the same crew. You become very close with each other. When I walk away from a project to my next one, what I remember mostly are my crew. I am a below-the-line member as a director of photography. I’m on the set with dozens and sometimes hundreds of crew members. We work directly hand in hand. That’s what I remember most – my relationships with crew members. Importantly, I learn everyday from my crew, and I take that away with me to the next job. That is what is so wonderful about the film business. They do become eternal life-long friends, colleagues and teachers. Kirill: What makes you stay in the industry despite being away from your family and friends, and all those crazy hours and pressure? Crescenzo: It’s the challenge. It’s the creative release. When you’re an artist and you have creative energies within your own being, you want to release those energies and stimulations. You can not sit still. That’s what keeps me involved and going. That’s my fuel for living. I can not see myself sitting behind a desk, doing a 9-to-5 job. What’s beautiful about my occupation is every single day I’m at a different location, working with different people on different stories. Everything is different every single day. That becomes extraordinary in terms of embracing life, growing as a person, observing your culture and society. It’s an evolution of an ever-lasting growing process of learning, not only about the things around you, but within yourself as a human being as well. It’s those challenges that keep me interested in what I do. And I’m proud, because after 30 years of shooting, I’m still very strong. I’m probably the strongest I’ve ever been. A lot of people get burnt out after a certain number of years. It’s a hard physical job that we do, and the concentrated level is unbelievably enormous. That’s what keeps me challenged, and because of that challenge, I find myself getting stronger personally, and very importantly, as a cinematographer. As cinematographers, we ‘see’, and to see, is to ‘feel’… It is a priviledge to be a cinematographer. And here I’d like to thank Crescenzo Notarile, ASC for this great opportunity to hear about the ever-evolving art and craft of cinematography. You can find behind-the-scenes photos of the second season of “Gotham” on his Twitter and Instagram feeds. I’d also like to thank Gabriella Belzer for making this interview happen. Finally, if you want to know more about how films and TV shows are made, click here for additional in-depth interviews in this series.